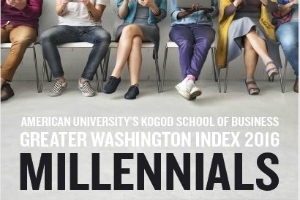 American University announces the second annual Kogod Greater Washington Millennial Index, a new report that provides actionable research for regional business and community leaders to help them understand, attract, manage or retain millennials in the greater Washington area. Millennials are the consumers and leaders of the future, attracting their tech-savvy skills and forward thinking perspectives will be essential for growth in the coming decades. Lead researcher Dawn Leijon, Executive-In-Residence, Kogod School of Business, found the greater Washington area remained well above average in 2016 in terms of satisfying millennials. This is despite the increased competitiveness of other job markets, the continuing growth in both population and traffic, and ongoing frustrations over Metro delays and SafeTrack shutdowns. However, as the generation ages and grows into family life, more and more will question the long-term viability of remaining in the region. According to the report, millennials are the first generation of digital natives. They rely on technology to live, work and socialize; and they expect automation, customization as well as the ability to always access what they want. Millennials are the largest living generation, numbering around 87 million members, and already surpassing Baby Boomers as the largest segment of workers. Their size and impact in the workplace will continue to grow as the youngest members finish their education and enter the workforce. "We began researching millennials in 2015 because the business community expressed a real need to understand what is important to this next generation of workers and leaders," said Erran Carmel, Business in the Capital Initiative Director, Kogod School of Business. "For this second report, we expanded the research to provide comparisons between the greater Washington area and other major U.S. cities, and we dug deeper into millennial attitudes and goals." The greater Washington area is in constant competition with other major cities to attract and retain the best and the brightest. Comparing the top 20 U.S. cities, the Index ranked D.C. second based on feedback from local millennials. When asked what millennials looked for in a place to live and work, Washington came out ahead of Boston, New York, Denver and other top cities for millennials. Only San Francisco, with its moderate weather and tech-heavy job market, ranks higher than the greater Washington area. The Kogod Greater Washington Millennial Index found millennials place the most value in the following factors: availability of jobs, salary levels, cost of housing, crime rate and commuting. Availability of Jobs – Jobs continue to be the highest priority for millennials. The D.C. area is the most professional (white-collar) city in the country; 52 percent of millennials over 25 hold a bachelor's degree and 24 percent of all D.C. residents over 25 have a graduate or professional degree. Additionally, Washington's unemployment is 23 percent lower than the nation as a whole. Salary Levels – Salary levels moved up from last year's Index to be the second most important factor. The average salary in D.C. is $65,910, 39 percent above the national average of $48,320. However, millennials living in Washington continue to face well-known challenges such as housing costs, commuting and crime. Housing Costs – Many cities are expensive, but only 12 percent of millennials surveyed felt confident in their ability to afford a home in the D.C. area. The high cost of living extends beyond the District to neighboring suburban areas as well. Crime rate – Thirty-nine percent of millennials said they are concerned about Washington's crime rate. Behind housing costs, crime is the second worse performing measure as D.C. delivers at 46% percent worse than the national average. Commuting – Commuters in the region have the second worse commute among the top 20 metropolitan areas. Sixty percent of millennials drive alone to work and 57 percent say they could commute via Metro, but do not because it is unreliable, time consuming and/or expensive. Childcare and healthcare costs are new factors added to the report in 2016. In Washington, childcare is 15 percent less affordable than the national average, but it rated as one of the least important measures to the millennials surveyed, the majority of whom do not have children. Healthcare rated high in importance and it is actually more affordable in the D.C. area when compared to the national average. "Millennials are marrying and having children later than some previous generations, but they are not giving up those traditional goals altogether," said Leijon. "As millennials get older and have children, their priorities shift. They rank affordability as their top priority and care more about work/life balance issues than their peers without children." Even though the greater Washington area's job market is among the best in the country, the high cost of living, heavy traffic and high crime levels may cause millennials to have second thoughts about staying in the D.C. region. Only 10 percent of those surveyed adamantly love the area and never plan to move. Employers and government leaders seeking to keep millennials in the area should focus on how to mitigate millennials' concerns over high living expenses, crime and difficult commutes to preserve and increase the appeal of this unique and vibrant mid-size city. The Kogod Greater Washington Millennials Index was created using publicly available data weighted based on survey responses from 504 greater Washington area millennials. The Millennial Index Score assesses the health of the region and compares its attractiveness across years. The score is an aggregate of five major categories comprised of 33 weighted factors based on their importance to Washington area millennials.